Nerheim tells us he has recruited a panel of volunteer former prosecutors, judges and attorneys to review high-profile cases to prevent wrongful convictions. [Nerheim's opponent, Chris] Kennedy, who served as an assistant state's attorney for four years, wants to form an in-house conviction integrity unit to prevent wrongful convictions. We think an independent outside board of volunteers would be more effective. Nerheim is endorsed. 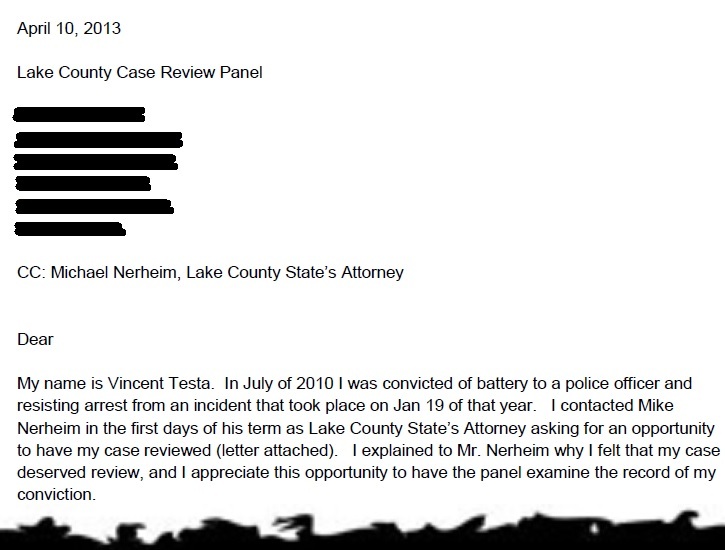 Soon after Nerheim was elected Lake County State's Attorney, he was contacted by Vince Testa. As I reported last week on this blog, in iFramed: The Case Review Panel, Testa maintains he was wrongly convicted of misdemeanor resisting arrest in Lake County. Furthermore there is convincing video evidence supporting Testa's declaration of innocence. Testa's case was among the first chosen, in early March, to be presented to the new Case Review Panel. But despite assurances that theirs would be an open and transparent process, Testa received nothing in the way of guidance from the States Attorney's office on how to proceed. By late March, Testa was asking his attorney to intercede on his behalf. In my initial email to Mike Nerheim, and in two subsequent emails, I inquired as to the protocol of bringing my evidence to the review panel. I have not received a direct response as to what procedures should be followed, how to submit evidence, and whether or not this procedure requires an attorney. Understanding that protocol is paramount, and given that I have received no response from Mr. Nerheim in that regard, I would like you to inquire on my behalf as to how to proceed. Eventually, Testa contacted the Case Review Panel directly, on April 10. He had to obtain the names of the panel members and their contact information from public sources. My name is Vincent Testa. In July of 2010 I was convicted of battery to a police officer and resisting arrest from an incident that took place on Jan 19 of that year. 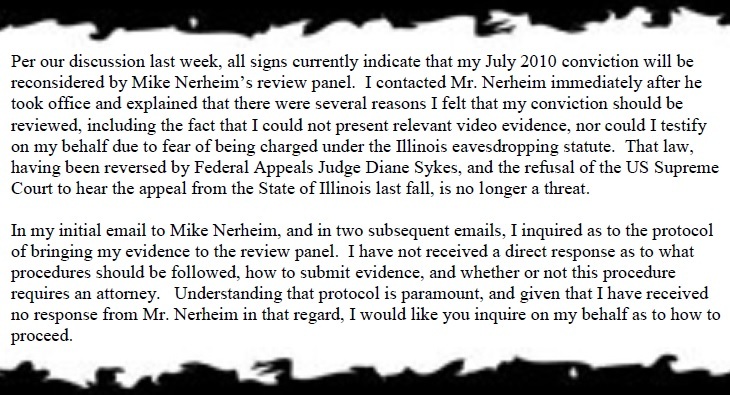 I contacted Mike Nerheim in the first days of his term as Lake County State's Attorney asking for an opportunity to have my case reviewed (letter attached). I explained to Mr. Nerheim why I felt that my case deserved review, and I appreciate this opportunity to have the panel examine the record of my conviction. Testa received a letter from Nerheim, seven days later on April 17, asking him not to contact the Case Review Panel Members directly. I am the only candidate to call for a fully independent Case Review Panel to review old cases and convictions, and to develop protocols for the prosecution of cases with forensic evidence, including DNA, going forward. While the Lake County State's Attorney's Office already has a conviction integrity unit to look at past cases and actively seek DNA testing to ensure the validity of convictions (which is similar to the proposal by my opponent), one of the key differences of my proposal is that the Case Review Panel that I propose will be independent of the State's Attorney's Office and will bring a fresh perspective and different set of eyes. This raises an obvious question, at least in my mind. If ordinary people like you and I are forbidden from contacting Nerheim's independent Case Review Panel, then how independent is it in reality? Michael Nerheim was elected Lake County State's Attorney on the promise that (unlike his opponent) his Case Review Panel would be independent of his office. Vince Testa believed Nerheim in this regard, when he sought to obtain an exoneration via the Case Review Process. Testa subsequently found out, though, that independence may depend on what your definition of independence is.